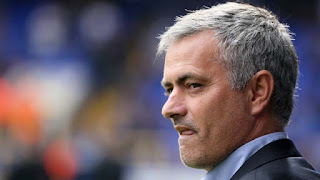 José Mourinho has taken a swipe at the Everton manager, Roberto Martínez, as the pursuit of John Stones continues to provoke anger on both sides. Mourinho, suggesting Martínez is in a “strange world”, remains baffled as to why he has furiously accused Chelsea of acting inappropriately and why he made public the initial bid of £20m that was rejected by Everton. Mourinho maintains the Premier League champions have dealt with the move for the 21-year-old, which could break the record for an English defender, in the correct manner and he will not relent in his pursuit. Stones is understood to be keen on a move to Stamford Bridge and a fresh bid – believed to be in the region of £32m – is expected this week. Mourinho appears frustrated by the saga and was quick to mock Martínez’s stance. “Our strategy for the Premier League is going to change next year,” said the Chelsea manager, who maintains Martínez has not informed him, via a letter, that Stones was not for sale at any price. With Luke Shaw costing £30m following his move from Southampton to Manchester last summer and Raheem Sterling transferring to Manchester City for £49m earlier this month, Mourinho knows the market – especially involving young English talent – is as inflated as ever. Stones cost £3m two years ago when he was signed from Barnsley yet Mourinho added: ”That is the market. And you only pay it if you want. If you don’t want to pay it, don’t pay. It’s as simple as that. The market has no rules or limits from season to season. The Chelsea manager, who has ruled out a switch for Belgian Axel Witsel, is taking on the New York Red Bulls on Wednesday as his Premier League preparations begin in earnest.